It was after an impossible winter at Ste. Croix Island where many of the first French settlers in North America died of scurvy that the French fur trading colony relocated across the Baie Française (Bay of Fundy), settling the following year in a location they named Port-Royal. 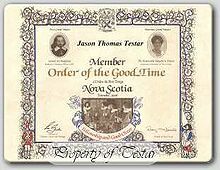 L’Ordre Du Bon-Temps, or in English, the Order of Good Cheer, was founded at Port-Royal at the suggestion of Samuel de Champlain and was chartered under the Royal auspices of the Baron de Poutrincourt and Pierre du Gua, Sieur de Monts. The Order’s practices were established by the first Chief Steward Marc Lescarbot. The Baron de Poutrincourt, Intendant to the King of France in North America, had been on an expedition on the Atlantic coast to the coast of present-day Maine, and, on the occasion of his return to the fort at Port-Royal, the Order was founded at a glorious reception, the preparations for which reportedly involved all those remaining at Port-Royal. His return on the 14th of November, 1606, is a date to remember in the annals of the New World, as the establishment of the first North American Order of Chivalry and the birth of the Nouveau Noblesse of New France. 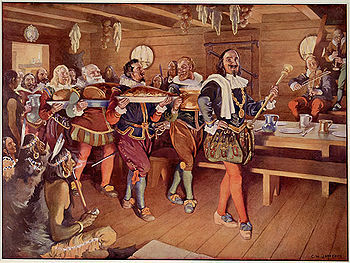 The feasting of the Order occurred weekly and continued throughout the winter until the last of March only to recommence annually in the Fall. “We meet tonight to witness an event. In 1606, there were less than 70 men at Port-Royal. Lescarbot states that, in total, about 50 Frenchmen, joined by Indians, participated in the welcoming home of Poutrincourt and the first gathering of the Order. However only fifteen men of birth are recognized as founding the Order. These would have been the only men present at the time of sufficient social standing with whom Champlain and the Baron de Poutrincourt would care to dine. The guests of the Order likely sat at other tables, probably getting equally good dinners as the rest, but without being recognized as official members of the Order. Likely everyone at the settlement took part in the staging of “Le Théâtre de Neptune en la Nouvelle-France,” written by Lescarbot and performed at the first celebration Order marking the first theatrical performance in North America. The founding Chevaliers of the Order were those who normally dined at Sieur Poutrincourt’s table. The main table of Poutrincourt, in the great hall of the fort was reserved for fifteen gentlemen of birth who are credited as the founding Matries d’Hotel or members of the Order and were known as The Nevoux Noblise of New France. According to official documents – ” Baron Poutrincourt was, no doubt, the Grand Knight of the Order, followed by Champlain, Lescarbot, Louis Hébert, Charles de Biencourt, Claude de La Tour, Charles de La Tour, Daniel Hay, the surgeon, Champdore, leaving six unknown, but, the records note that Sagamore Membertou was always treated as their equal, it is quite certain he was at that table, leaving five to be accounted for, if documents to that effect can be found. Description of the order of Good Cheer: “The first winters of the French in Acadie were very painful and cost the life of several men. One has to only think of the first winter in the Sainte-Croix Island in 1604-1605 when more than thirty men of the company the sieur de Mons perished by the scurvy. The winters in Port-Royal were less rigorous, but nonetheless long and dull. 2, Rameau de Saint-Père, François-Edme (1889) (in fr). Une colonie féodale en Amérique [l’Acadie (1604-1881)]. 1. Paris: E. Plon, Nourrit et Cie. p. 33. Retrieved 2010-11-26.